Positioning of the patient depends upon the laparoscopic procedure to be performed. Most pelvic laparoscopic procedures are performed with the patient in a supine, low-lithotomy position with the arms secured at the sides of the body. In contrast, upper tract laparoscopic procedures are performed with the patient in the flank position. In the lateral position, all bony prominences must be carefully padded. The patient is securely fastened on the operating table by two to three circumferential wraps of a 6 inch cloth adhesive tape and a belt. In the lateral position, the bottom leg is flexed approximately 45° while the upper leg is kept straight; two to three pillows are placed between the legs as a cushion and also to elevate the upper leg so that it is on the same level as the flank, thereby obviating any undue stretch on the sciatic nerve. Similarly, an axillary roll is positioned below the dependant axilla to prevent brachial plexus injury. The head and upper extremities are placed in a neutral position. We prefer the use of a double arm board for positioning the upper extremities. 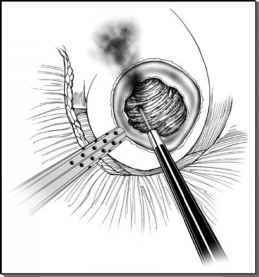 Application of active warming systems may prevent hypothermia should a lengthy laparoscopic procedure be anticipated. Similarly, use of pneumatic compression stockings is helpful in minimizing postoperative thromboembolic events. Previous incisions and scars and the surface anatomy is clearly marked prior to surgical preparation, and draping is commenced. Before major laparoscopic procedures, a naso- or orogastric tube and a Foley catheter are usually placed to decompress the stomach and bladder, respectively, thereby decreasing the chance of injury of abdominal contents during insertion of the Veress needle and the initial trocar.